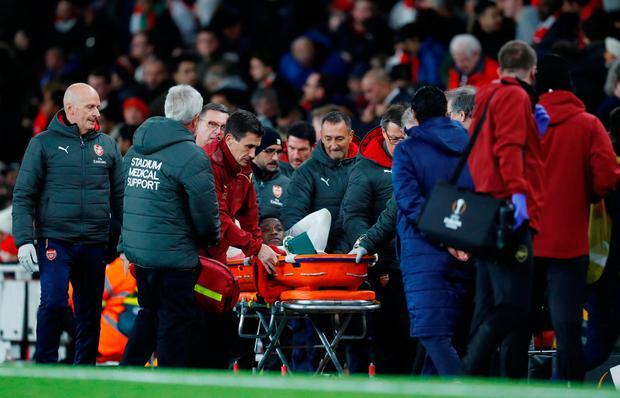 Arsenal manager Unai Emery has suggested that striker Danny Welbeck has 'a break of something in his ankle', after he was taken off on a stretcher during during the Europa League game against Sporting Lisbon at Emirates Stadium. The Gunners qualified for the knockout stages of the Europa League with after a 0-0 draw against their Portuguese rivals, before Emery confirmed the club's worst fears as he revealed Welbeck suffered an injury that will keep him out of action for a lengthy period. "This could be a break of something in the ankle," stated Emery. "It's a different injury to others. This is the worst news. Now he is at the hospital. The news is that we are going to wait, but we think it’s a serious injury. "Danny is a very good person, his commitment with us is very big. He helps us with his quality and capacity. His injury also affected the mentality of the players as they could see it was a big injury. "When one player has an injury like that, every player on the pitch they look at this injury. First it's in your mind - you think for the player. But I think the players were concentrated on the match and we forgot this injury the next minute on the pitch. But when the match finishes, the first thing they did was ask for him. "I think Danny was working well and was playing a good match. His injury was hard also for the mentality of the players because they looked at the big injury, but when you are playing football in competitive matches it can happen. We don't want it, but this is our profession." Yet a 15th game unbeaten for Unai Emery's side at least assured them of European football after the turn of the year with two group matches left to seal top spot.